People have long wondered how the world came into being. They have answered the question with stories that describe the origin of the universe or the world and usually of human life as well. Creation myths, known as cosmogonies, express people's understanding of the world and their place in it. The world's mythologies and religions offer an immense variety of creation stories. Yet scholars have discovered that the cosmogonies of different cultures fall into broad categories and contain many shared themes. Some creation stories, such as those of Africa and Polynesia, existed for years in spoken form but were not written down until recently. Other cultures preserved their cosmogonies in written texts, and some of these have survived from ancient times. The Babylonian epic Enuma Elish, written thousands of years ago, tells how people in Mesopotamia * explained the beginning of the world. 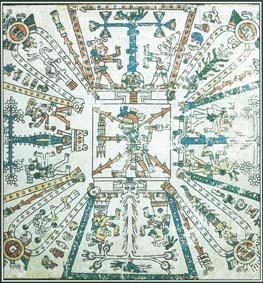 A Mayan text called the Popol Vuh describes the creation of the ancestors of the Maya. Types of Creation. Some methods of creation appear again and again in cosmogonies from different parts of the world. One of the most common images is a description of the beginning of the world as a birth, a kind of creation familiar to everyone. The birth may result from the mating of a pair of cosmic parents. The Maori of New Zealand, for example, say that the union of Rangi and Papa (Father Sky and Mother Earth) produced all things. The hatching of an egg is another familiar kind of birth. Some creation myths tell of a cosmic egg containing the seeds or possibilities of everything. The hatching of the egg lets the possibilities take form. The Hindu texts known as the Upanishads describe the creation of the world as the breaking of a cosmic egg. Another type of cosmogony says that the actions, thoughts, or desires of a supreme being or creator god brought the world into existence. The book of Genesis in the Old Testament of the Bible tells how God created the world and everything in it. Other accounts of creation by a supreme being can be found in many regions, from the island of Hokkaido in northern Japan to the island of Tierra del Fuego in southern South America. Sometimes the created order simply emerges from a primal chaos—a state of disorder. In Norse * mythology, the scene of creation is an emptiness of wind and mist until clouds form and harden into the frost giant Ymir, from whose body the world is made. Many Native American myths tell how animals and people appeared on earth by climbing out of a chaotic or primitive underworld. The primal chaos is often a flood or a vast expanse of water. The people of ancient Egypt—who relied on the yearly floods of the Nile River to support their agriculture—said that before creation there existed only Nun, a watery abyss. In some flood myths, creation takes place as the waters recede or as land rises. In others, an earth diver, a bird or an animal, plunges to the bottom of the water and brings up mud that becomes the earth. Such myths, which are common among Native Americans, seldom explain where the mud or the earth-diving creature came from. Many cosmogonies concern the shaping or ordering of the world rather than its creation from nothingness. They often begin with some substance, being, or active force already in existence. In some mythologies, the creation of people occurs through emergence from the earth. Native American groups such as the Hopi, Zuni, and Navajo say that the first people traveled though a series of lower worlds to reach their permanent home. In some stories, a flood forces the occupants of the lower worlds to climb upward until they arrive on the surface. Themes in Creation Myths. In explaining how creation led to the world as it now exists, cosmogonies explore several basic themes. Most creation myths illustrate one or more of these themes. The theme of separation or differentiation deals with the forming of distinct things out of what was once a formless unity. Separation may be a physical act. In Polynesian myth, for example, the children of Mother Earth and Father Sky force their parents apart so that the world can exist between them. Cosmogonies may describe creation as taking place in stages that mark the process of differentiation. The Old Testament says that God took six days to create light and darkness, the heavens, the earth and plants, the sun and moon, the sea creatures and animals, and the first people. A second theme is imperfection. According to many cosmogonies, the creator planned to make a perfect world, but something went wrong. As a result, flaws such as evil, illness, and death entered the creation. The Dogon of West Africa say that the world is imperfect because one of a pair of twins broke out early from the cosmic egg. The Hawaiians relate that the earth goddess Papa cursed humans with death after she discovered an incestuous affair between her husband and daughter. Dualism, or tension between opposing forces, is an underlying theme of many creation stories, especially those that revolve around conflict. Greek myths about the war between the Titans * and the gods are just one example of conflict between cosmic parents and their offspring. Sometimes the conflict involves twins or brothers. Some Native Americans of the northeast woodlands explain that the world is the way it is because two gods played a role in its creation. Gluskap, good and wise, created plants, animals, and people. His evil, selfish brother Malsum made poisonous snakes and plants. The theme of sacrifice reflects the idea that life is born out of death. Someone must die, or at least shed blood, before the world and life can begin. The Enuma Elish tells how the god Marduk killed the primeval goddess Tiamat and cut her body into two parts that became the heavens and the earth. Sometimes the first people are made from a god's blood, perhaps mixed with dust or clay. Creation may also involve the slaying of a primal beast or monster. A few cosmogonies describe cycles in which the world is created and destroyed a number of times. Hindu scriptures say that Brahma * has remade the world many times. Four ages, or yugas, make a kalpa, or eon. When a kalpa ends, creation dissolves into chaos. Modern scientists think that the universe began billions of years ago with an explosion of matter and energy called the Big Bang. The Native American Omaha people have their own "big bang" account of creation. At first all living things were spirits floating through space, looking for a place to exist in bodily form. The sun was too hot. The moon was too cold. The earth was covered with water. Then a huge boulder rose out of the water and exploded with a roar and a burst of flame that dried the water. Land appeared. The spirits of plants settled on earth. Animal spirits followed. Finally the spirits of people took bodily form on earth. The Aztecs of Mexico believed that the present world was the fifth that the gods had created. It was fated to end in universal destruction by earthquakes. The four previous worlds had been destroyed by a great flood, the falling of the sky, a fire storm, and a wind storm. The Maya believed that the gods made three unsuccessful attempts to create human beings before achieving a satisfactory result. Their first creations—animals, people made of mud, and wooden people—disappointed them in various ways, and they abandoned or destroyed them. Finally, the gods made people of maize (corn) who were perfect, so perfect that their creators clouded their vision to prevent them from seeing too far. Every region of the world has produced numerous creation stories, and some cultures and religions have more than one. A sampling of myths from various sources shows both the endless variety of cosmogonies and the similarities in their structures and themes. Africa. Some African creation myths feature a huge snake, often identified with the rainbow, whose coils make up the universe. In West and Central Africa the idea of creation from a cosmic egg is common. Twins or paired, dualistic powers appear in many African creation stories. The Fon of West Africa tell of the first mother, Nana Buluku, who gave birth to the twins Mawu (moon) and Lisa (sun), the parents of all the other gods, who were also born in sets of twins. Some African cosmogonies, however, are less concerned with the creation of the physical universe and the gods than with the appearance of the first man and first woman and the ordering of human society. The notion of a supreme creator god appears throughout Africa. The Bushongo people of the Congo region called the creator Bumba. He was the sole inhabitant of a watery universe until he vomited up the sun, which dried the water. Then he vomited up the first animals and people. The Americas. The Incas of South America claimed that darkness covered the earth until the god Con Tiqui Viracocha rose out of a lake, bringing with him the first people. He made more people out of rocks, then sent them out to populate the whole world. When these inhabitants rebelled against Con Tiqui Viracocha, he punished them by stopping the rainfall. A god named Pachachamac overthrew Con Tiqui Viracocha and created a new race of people, the ancestors of humans. Creation myths of Native Americans generally explain how the world took its present form, including the origins of human culture. Some tales feature a creator god or pair of gods, such as the Sun Father and Moonlight-giving Mother of the Zuni people. Many groups, including the Cheyenne, have stories of an earth diver. Indians of the Southwest may have developed myths of emergence because their agricultural way of life led them to think of growth as a movement upward from below the earth's surface. The Hopi of Arizona say that creation brought four worlds into existence. Life began in the bottom level or cave, which eventually grew dirty and crowded. A pair of twin brothers carried plants from heaven, and the people climbed up the cane plant into the second cave. When that place became too crowded, they climbed up again into the third cave. Finally, the brother gods led the people out into this world, the fourth level of creation. Near East. The ancient Egyptians believed that before the world existed there was only Nun, the watery nothingness. Then a mound of land rose, giving the first deity a place to live. In some accounts, the first deity took the form of a bird. Others said that a lotus flower containing a god rose from the water. Cults developed around several Egyptian creator gods: Amun and Atum, the sun gods; Khnum, who made men and women from clay and breathed life into them; and Ptah, who created the other gods by saying their names. Aztec mythology tells of four creator gods, each associated with a direction and a color—Tezcatlipoca, the north and black; Quetzalcoatl, the west and white; Huitzilopochtli, the south and blue; and Xipe Totec, the east and red. This drawing shows Hueheuteotl, the god of fire, surrounded by the four directions. Among the Semitic * creation myths of western Asia is the story of how God formed the world, the Garden of Eden, and Adam and Eve, the first parents. It is the cosmogony of the Christian, Jewish, and Islamic faiths. In the dualistic Persian or Iranian cosmogony, the good and wise lord Ahura Mazda began creation by sending beams of light into an abyss where Ahriman, lord of evil and sin, lived. Ahura Mazda cast Ahriman into hell for 3,000 years. This gave Ahura Mazda time to create spirits of virtue, angels, and the creatures of earth, including Gayomart, the first man. When Ahriman's time in hell ended, he created flies, germs, pests, and other evils. One of his wicked followers brought disease and death to Gayomart, but a plant that grew from Gayomart's remains bore fruit that became the human race. Asia. Japanese tradition, preserved in a volume of mythological history called the Kojiki, says that before creation there was an oily sea. Gods came into being in the High Plains of Heaven. After seven generations of deities came the first human ancestors, whose task was to make solid land. They stirred the sea with a jeweled spear. Drops that fell from the spear formed the islands of Japan. A Chinese creation myth tells how Pan Gu hatched from a cosmic egg. One part of the eggshell formed the heavens; the other part became the earth. For 18,000 years, Pan Gu stood between them, keeping them apart by growing ever taller. Finally he became weary, lay down, and died. From his eyes came the sun and moon, from his hair the stars, from his breath the wind, and from his body the earth. Indian mythology, linked to both the Hindu and the Buddhist religions, contains many creation stories. Hindus often speak of Brahma as the creator god who brought the universe into being through his thoughts. Sometimes creation involves the sacrifice of a primal being such as Purusha, from whose body all the gods were made. Other myths describe the breaking of a cosmic egg or the union of heaven and earth as cosmic parents. 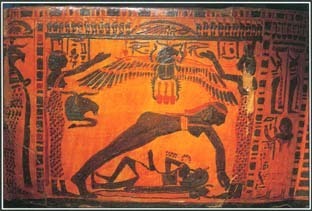 This scene from a sarcophagus in Thebes illustrates part of an Egyptian creation myth. According to this myth, the world was produced from the union of the earth god Geb and the sky goddess Nut. Australia and the Pacific. In the mythology of Australia's native peoples, the period of creation was called Dreamtime, or The Dreaming. During this time, ancestral beings created the landscape, made the first people, and taught them how to survive. Some Aboriginal myths tell of a great flood that destroyed the previous landscape and the former society. According to many accounts, a great serpent caused the flood when he became angry with the ancestral people. The vast Pacific Ocean contains the Polynesian, Melanesian, and Micronesian island groups, which produced a variety of cosmogonies. Not surprisingly, many of these myths involve water. According to some Polynesians, a creator god named Tangaloa sent a bird messenger over an endless primal sea. At last Tangaloa threw a rock into the sea so the tired bird would have a place to land. Then the god created all the islands in the same way. The bird made the first people by giving arms, legs, hearts, and souls to maggots. Other Polynesian stories describe creation as the union of two opposing qualities: Po (darkness) and Ao (light). Polynesian and Micronesian cosmogonies often include the act of separating the earth from the sky. Melanesian creation myths generally involve ancestral heroes who wander from place to place, forming the landscape and creating the rules of society. Other entries related to creation stones are listed at the end of this article. Greek cosmogonies, echoed by the Romans, begin with birth and end with struggle. Gaia, the earth mother, emerged from chaos and gave birth to Uranus, the sky. The union of Uranus and Gaia produced plants, animals, and children, the Titans. Imprisoned by their father, the Titans overthrew Uranus, only to be overthrown by their own children, the gods. Another Greek creation myth, possibly borrowed from the ancient Near East, combines many images and themes. It tells how a primal goddess emerged from the waters of chaos. Her union with a serpent produced a cosmic egg that split to become the heaven and the earth. See also African Mythology ; Australian Mythology ; Aztec Mythology ; Buddhism and Mythology ; Celtic Mythology ; Chinese Mythology ; Dreamtime ; Egyptian Mythology ; Enuma Elish ; Finnish Mythology ; Floods ; Gluskap ; Greek Mythology ; Hinduism and Mythology ; Inca Mythology ; Japanese Mythology ; Mayan Mythology ; Melanesian Mythology ; Micronesian Mythology ; Native American Mythology ; Norse Mythology ; Persian Mythology ; Polynesian Mythology ; Roman Mythology ; Semitic Mythology ; Upanishads . [See Names and Places at the end of this volume for further information.